>> What Is Feldspar Used For In Jewelry? What Is Feldspar Used For In Jewelry? Whether or not you know it, you’ve come across Feldspar hundreds of times in your life. Feldspar itself isn’t even a gemstone – it’s an alumina and silica inclusive mineral and holds the title of being the earth’s most abundant mineral! In fact, this mineral makes up approximately 60% of the rocks you see on a daily basis. We know what you’re thinking – “why is a wedding and engagement website talking about rocks? !” Well, because feldspar consists of more than just rocks, it’s also consists of gemstones. There are two varieties of Feldspar that produce gemstone quality stones – potassium feldspar and plagioclase, both of which produce gemstones that you might surprise yourself knowing! Potassium Feldspar is a form of feldspar that contains potassium – creative naming, right? 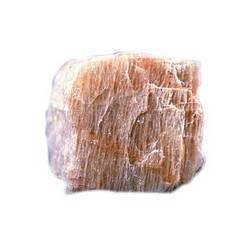 This form of feldspar is known for its glasslike luster which makes the minerals within it popular options for jewelry. Potassium Feldspar consists of amazonite, moonstone and orthoclase. The stones within the potassium Feldspar class range between 6 and 6.5 on the Mohs Hardness Scale making them durable enough as additions to pieces of jewelry, but weak enough to demand special care and attention. Amazonite is one type of potassium Feldspar. 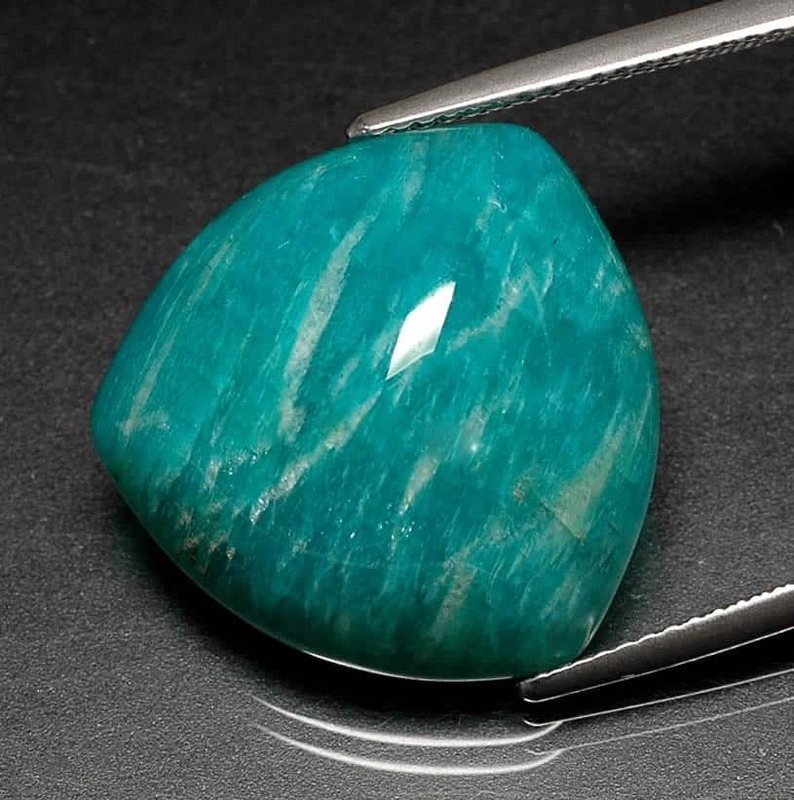 This beautiful sea-green mineral is presumed to be named after the mesmerizing shades of the Amazon river, though this particular stone had never been linked with the location. Amazonite value has a wide range and the most highly sought variations have even color distribution, though irregular color is more common. While amazonite is an undoubtedly stunning stone with magnificent coloring, this mineral isn’t very tough and will crack and chip under pressure – as a result, amazonite isn’t a popular option for jewelry that will be worn daily such as wedding or engagement bands, though it is a wonderful option for lesser worn statement pieces. 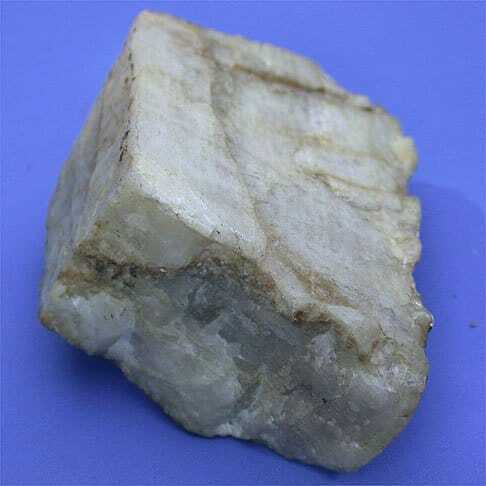 The most popular potassium Feldspar is moonstone, which is actually a mixture of two types of feldspar, orthoclase and Albite. When orthoclase and albite form, they retract lighting within their layers and that light scatters – this effect, called adularescence, gives moonstone its characteristic other world-like glow. Moonstone varies in price from mere pennies to thousands of dollars and the value is dependent on the stones coloring. 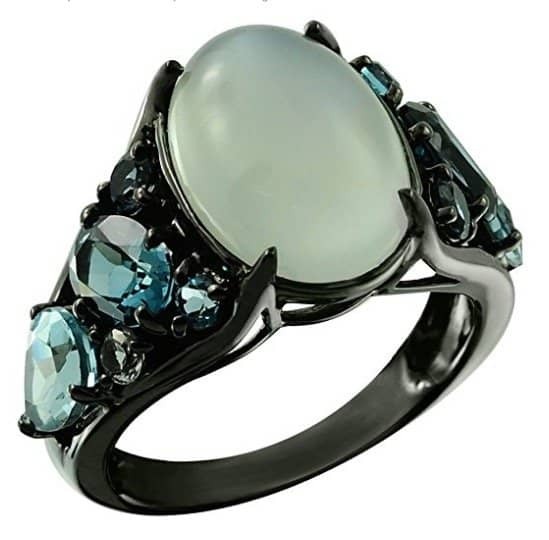 While moonstone comes in a wide range of colors, the most valuable stone is both transparent and colorless with a blue adularescence radiating from within. While moonstone is the most popular potassium Feldspar, orthoclase is the most rare. Orthoclase is sometimes called the champaign Feldspar due to its deep yellow hue! While orthoclase does develop in pinks, blues and greens, the most highly sought after varieties of this stone are the ones of yellow variety. Orthoclase has a nearly perfect cleavage, making it a wonderful stone for cutting – though a form of this stone that has undergone too much variance from a cut is unfavorable because this stone’s value is mostly determined by its size. Watch this video below by Sloane Rhodes to get even more information about beautiful moonstone! Plagioclases is a variety of feldspar that is rich in calcium and sodium. Like potassium feldspar, plagioclases has a Mohs Hardness rating that falls between a 6 and 6.5. Unlike potassium feldspar, plagioclases doesn’t have a glass-like sheen, but rather it is known for its high refractivity which is comparability to that of Beryl and Quartz. One form of plagioclase is labradorite. Labradorite is known for its internal shine that carried an array of blue and green colors that are comparable to the Northern Lights. The internal shine of labradorite is called labradorescence and is the product of light getting diffused within the layers of the stone. Though this sounds a lot like moonstone, labradorite and moonstone are not the same. Labradorite is a darker stone than moonstone – while without light moonstone is typically clear, labradorite is a dark shade of grey. Labradorite is also a higher density stone, making it a tougher stone than moonstone and less susceptible to cracks and breaks under pressure. While labradorite is undoubtedly a stunning stone, it is still fighting for popularity amongst the wide array of gemstones that are typically used for wedding or engagement rings. Watch this video by Contessa Miller to find out more about Labradorite and its amazing properties. Andesine is another form of plagioclase feldspar. Andesine is sometimes also referred to andesine labradorite because it is known to have a hint of the labradorescence for which labradorite is known. Andesine is a beautiful reddish tinted Pink of orange stone that is found in both lustrous and dull forms. Though undoubtedly stunning, andesine is faulted by being a soft stone that is prone to cracking and fracturing under pressure – making it a questionable option for wedding and engagement rings. Andesine is an inexpensive stone, in part due to softness and in part due to its newness in the mineral world. Discovered as recently as 2003, andesine is still being researched and evaluated, but as it stands, there is no current information as to the durability of this feldspar stone. 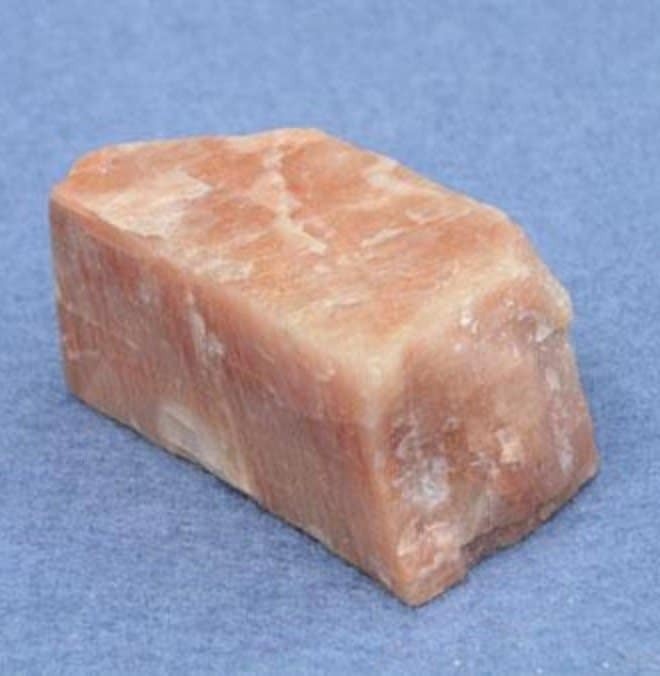 The final form of plagioclase feldspar is sunstone. 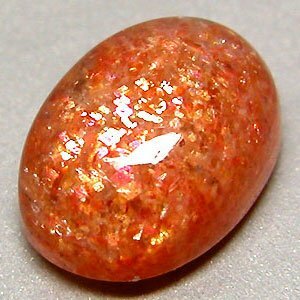 Resulting from miniscule red copper inclusions, sunstone has a glow that can’t be described as anything but dazzling. 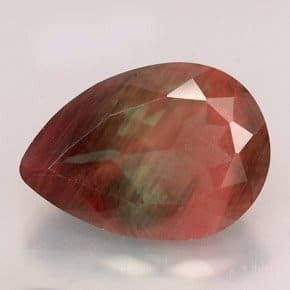 Sunstone ranges in color but is most desirable in shades of dark orange and red, though it is most commonly found in lighter hues such as peach. The peculiar thing with sunstone is the fact that more inclusions raise the stones value rather than depreciate it, as is the case with most stones – this is due to the fact that sunstone is rather dull and undesirable stone without the glow caused by the inclusions. Sunstones price ranges – it can be purchased for as little as 50 dollars a carat or as much as 1000 dollars a carat – this price is dependent on the intensity of the stones color, the size of the carat and the number of inclusions within the stone.